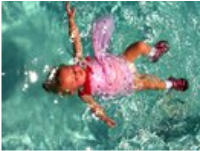 A child who is walking or very close to walking (usually anytime after 12 months to about 8 years) will learn a swim-float-swim sequence. 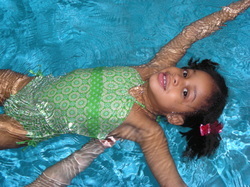 He or she will be taught to swim face down using arms and legs (similar to a freestyle stroke); roll on his or her back to float, rest and breathe when he or she needs air; and then flip over onto his or her stomach to continue swimming until he or she reaches the wall or stairs. This swim-float-swim sequence can be repeated as many times as is necessary to reach safety. Lessons approx 15 mins. will then practice their skills in summer clothing and then progress onto winter clothing. This additional work is critical to survival swimming because most children who find themselves in the water are alone fully clothed.